Animals turn up all kinds of places where you don’t expect them. 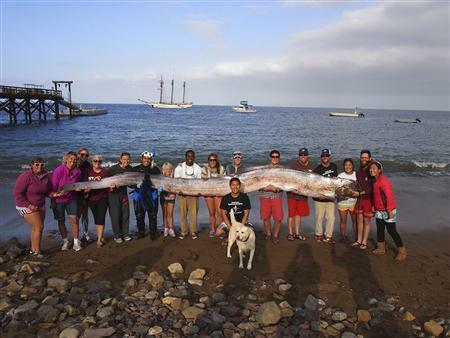 Yesterday, a snorkeler swimming in shallow water ran into an 18-foot oarfish. Believed to be the inspiration behind the mythical sea serpent, oarfish usually hang out a few thousand feet below the surface of the water. As for snorkelers. . . well, they’re people, so they usually hang out on land. Seems like both of these creatures were out of their normal habitat. Check out this video which includes some photos of other oarfish that have been found over the years.